← Playmobil’s Fastest Selling Toy Ever Is…Martin Luther? I recently perused through a Gideons Bible and happily learned that Gideons recently switched English translations from the NKJV to the ESV. So what’s changed with the Gideons ESV? A lot, specifically in the New Testament. 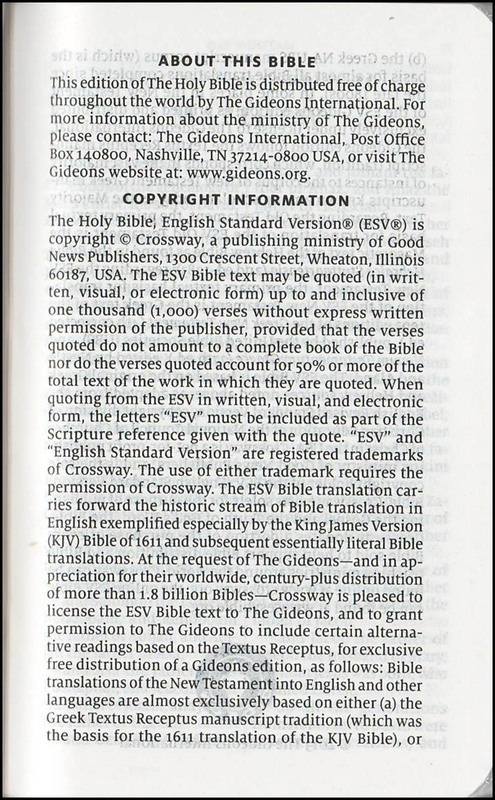 In the copyright granted to the Gideons, it states, “…Crossway is pleased to license the ESV text to the Gideons, and to grant permission to the Gideons to include certain alternate readings based on the Textus Receptus….” The result? Compared to the regular ESV (which mainly uses the UBS/Nestle-Aland 27th edition) the new Gideons ESV has over 50 alternate readings. Gideons announced the reason for the move from the NKJV to the ESV here. This entry was tagged Crossway, ESV, Gideons, Textus Receptus. Bookmark the permalink.